Barbara Schrag was born in Roseburg, Oregon, in 1950. When Barbara was four years old, her family moved to Seattle and Barbara grew up there. Barbara developed Polio as a child and was very sick. Polio is a disease that makes your bones weaken and Barbara was forced to stay in bed. Her father bought her art materials so she would have interesting things to do while recuperating in bed. Her father always encouraged her art work, until his death in 1970. 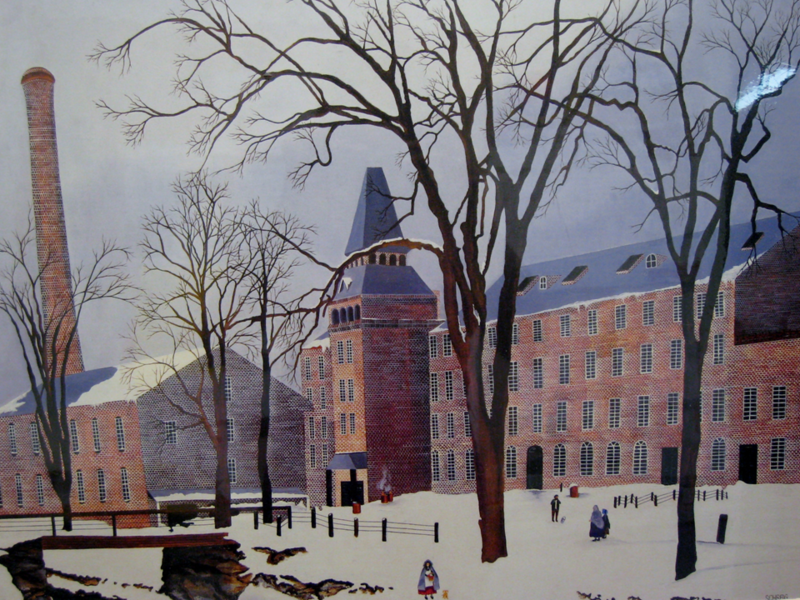 Barbara spent hours and hours sketching and painting. She learned to love art and taught herself to paint. After Barbara met her husband, Andrew Schrag, he took her to a Folk Art Gallery, in New York City. Barbara showed the gallery her work and they loved it. Her work was displayed in the gallery that very day. A gallery owner from Switzerland saw her work displayed there and asked Barbara to represent the United States in an International Art Competition. 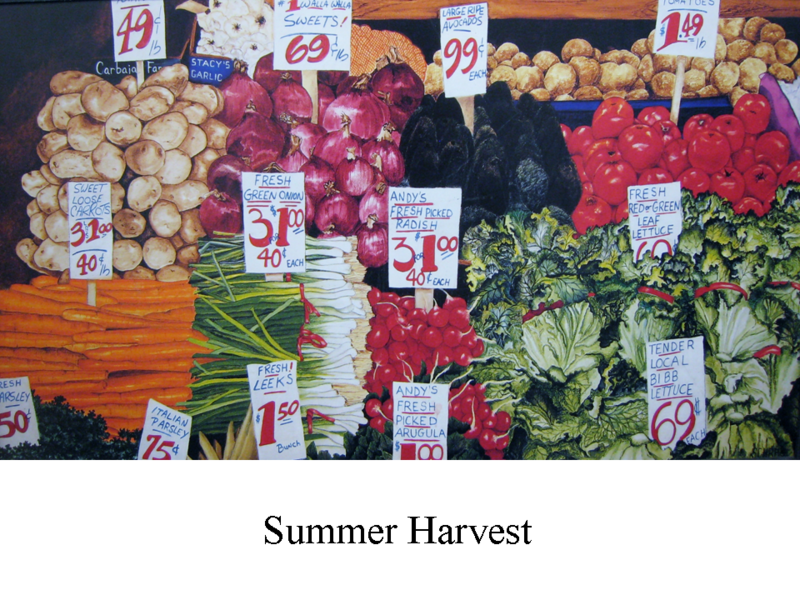 Barbara’s art is considered Folk Art, also called Primitive Art. This style of art doesn’t look like the styles of art that are taught in a formal art school. Folk Artists teach themselves how to paint without art lessons or formal training. Folk Art is created by ordinary people, who are not professional artists, and it usually shows the things that ordinary people do everyday. Sometimes Folk artists like to paint history. Folk art is found in every culture around the world. It has been around since ancient times and folk art is still created today. 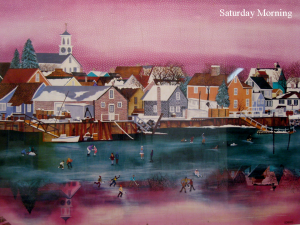 When we look at Folk Art created a long time ago, we learn what the buildings looked like, what people wore, what was important to them and what people were proud of in their time. Many professional artists in modern times have copied the primitive style of Folk Art. Two of these professional artists who painted with a Folk Art style were William H. Johnson and Jacob Lawrence (13. Male African-American Masters). These two artists had formal training but became famous creating their own version of a Folk Art style. 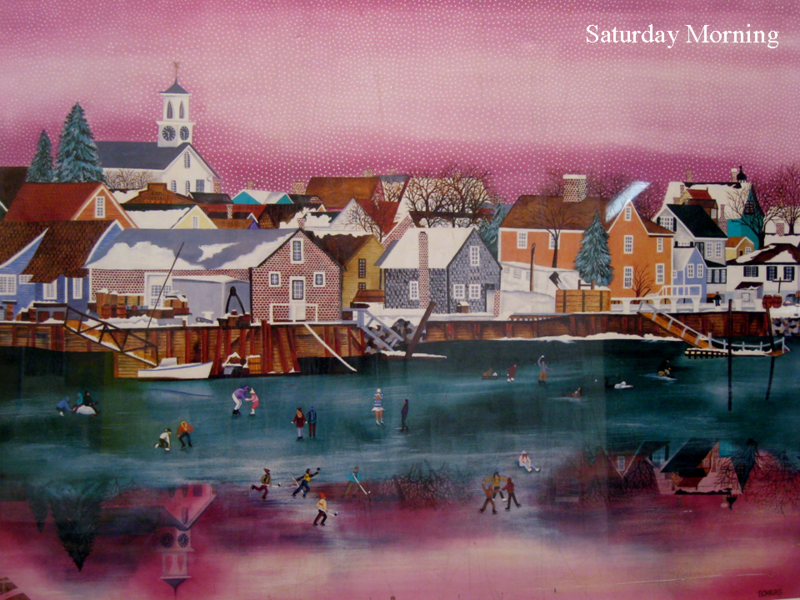 Barbara Schrag’s work is very colorful and the detail is extremely fine. She tries to make each picture a place you would want to walk into. Her paintings are usually very large. Barbara donated these prints of her original paintings to Evergreen Public School’s Art Discovery Program. 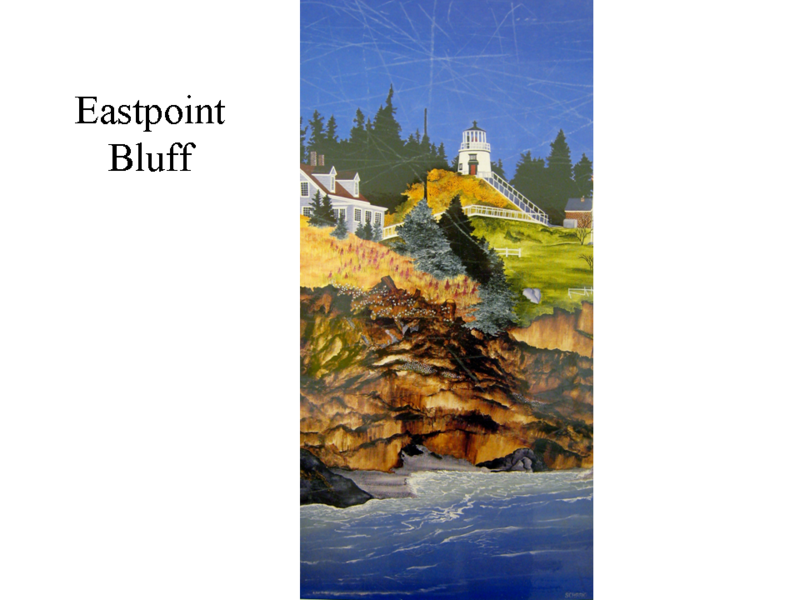 Her original paintings can be found in collections in England, Switzerland, New York, Florida, Seattle, Washington and Cannon Beach, Oregon. Barbara now lives in Vancouver, Washington. Grandma Moses is Barbara Schrag’s favorite artist. Grandma Moses was a self-taught Folk-artist, much like Barbara. Grandma Moses’ real name was Anna Mary Robertson Moses. She was born in 1860 and began painting at the age of 76, when she was a grandma. Grandma Moses never had an art lesson but people loved her lively, simple pictures of the memories of her rural life growing up and living in upstate New York. 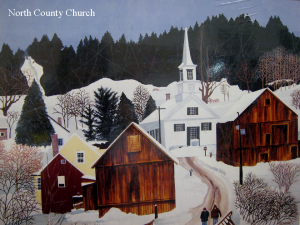 Her paintings were memories of things like the countryside of her childhood farm, her schoolhouse, cutting the family Christmas tree and skating on a country pond. These pictures were familiar, happy scenes from her long, happy life. Anna lived past the age of 100 and kept painting until two weeks before she died, in 1961. 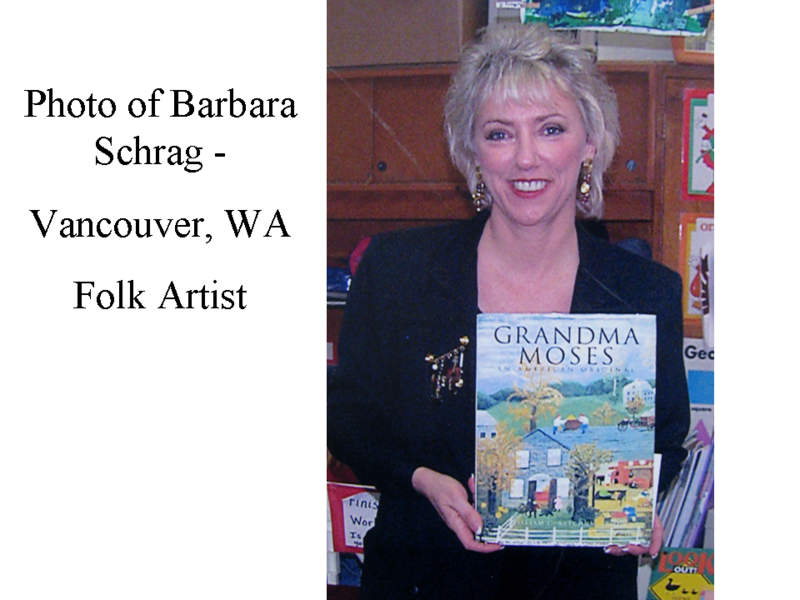 Barbara Schrag was inspired by the life and art of Grandma Moses. Barbara Schrag feels that everyone is an artist; that art is in all of us. If you asked Barbara—“What is the most important thing a person can do if they want to become a better artist?”—she would say, “Practice as much as you can! Great basketball players practice all the time—so must great artists!” Barbara feels that painting is a great stress reliever. She points out that art was a way primitive man communicated before there was any written language. People can use art to communicate when they don’t speak the same language. A picture is a good way to get an idea across to someone else without using words. Although Barbara feels that original paintings on canvas are very nice, she also feels they are very limited. When a print is made of an artist’s original work, many people can enjoy the art work. (Just like we are able to do with the art prints Barbara Schrag donated to the Art Discovery Program.) The painted picture can also be made smaller or larger. Barbara’s original paintings are usually very large and that limits where they can be hung. Barbara Schrag says she changed this picture quite a bit from what she actually saw. The building did not have a sign on it, the door wasn’t red and the buoys were not as bright! Is it okay for an artist to change a scene and make it look different than what they really saw? Of course, artists can change whatever they want. Things artists actually see can inspire them to paint but there is no rule that says they have to paint something exactly the way it looks. Do you know what a buoy (boo-ee) is? In this picture, a buoy is a float that holds up a net for a trap to catch fish. Try to count the many buoys in the picture, it isn’t that easy. There are many details in this painting. Notice how the door and the covered window have cracked and peeling paint. What other kinds of details do you see? The front of the building is shingled with “shakes”. Shakes are wooden shingles, just like the shingles some people put on their roofs. There are many different shades of brown because there are many separate rectangles of wood. Stacked to the right of the door are lobster traps. The front of the building is covered with buoys, all the way to the roof. Why didn’t the artist paint a BACKGROUND in this picture? She zoomed in on the front of the building so closely that we don’t even see the entire building front. Since there is no background and not much of a foreground in this picture, where is this building situated? By the ocean What clues tell you this, how do you know? 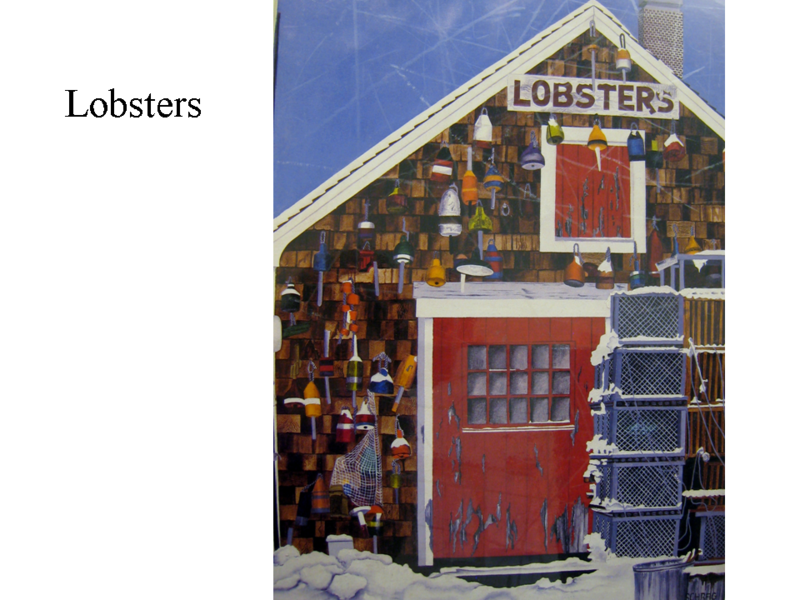 The details of the picture, except for the snow, are all things that are used by ocean fishermen. How did the artist get your eyes to start here? The large area of red, contrasting sharply with the white trim of the door and the dark brown of the building’s siding, attracted our eyes to this spot first. If there is a view of the front of a house (or any other buildings) from the classroom window, have the class lightly sketch this with a pencil. Now, change 3 things to make the building different than the way it REALLY looks in the scene and paint the finished sketch. SUGGESTIONS: change the size or shape of the door or the window(s), add a drawing of something that was never really there (like a plant, statue, tree, bush, flowers, etc. 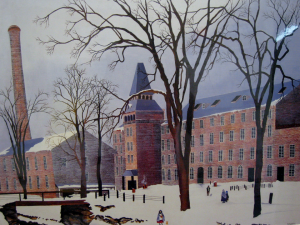 ), paint something in the scene a brighter color than it really is, or give the building a completely different color. Bring in some colored pictures of buildings from magazines or the internet. Give one to each child to sketch and paint on paper. Everyone should change three things to make the building in the scene different (see above). Encourage everyone to focus on the building more than the scene around it. It might be more interesting to display the original photo or picture of the building with the finished painting. Barbara was staying in a Bed & Breakfast, in Vermont, when she opened the windows and was taken back by the quiet brought on by the fresh blanket of snow that had covered everything. When Barbara was asked to represent the USA in the International Conference of Folk Artists, she brought this painting with her. How does an artist make snow look real? This artist painted the white with areas of blue and gray tones. 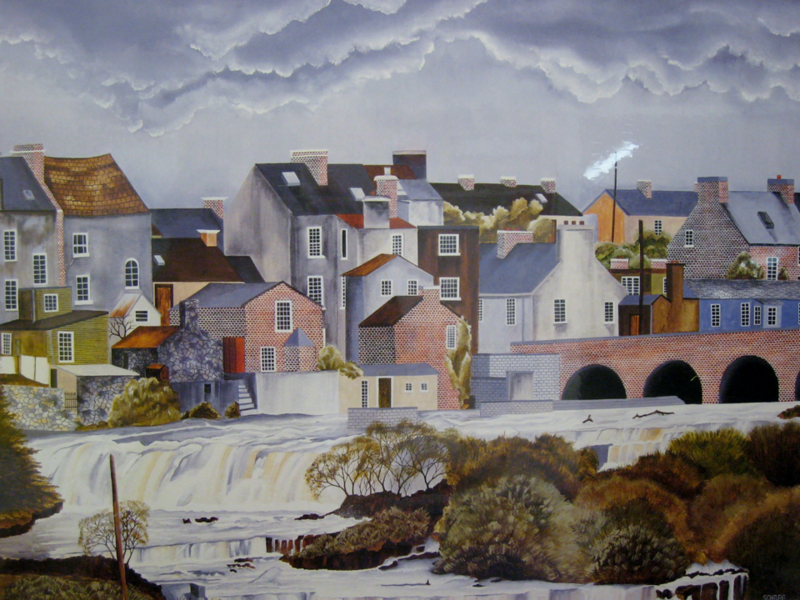 Why would an artist choose to paint only the tops of the buildings? To show all the angles of the buildings. This is not the usual perspective of a neighborhood scene, so it makes the scene more noticeable to the audience. Cut out several different SHAPES in various sizes and colors of geometric triangles, squares and rectangles. Arrange these on a large sheet of blue paper (for sky) to create a scene of several rooftops with chimneys and some windows. Focus on creating a picture that emphasizes the rooftops and don’t show much of the lower areas of the houses. Use crayons or markers to draw trees and other details in the background. You might cut pieces of white paper to form snow if you want to create a winter scene like this picture. Barbara Schrag was driving around with her husband and liked this setting when she saw it. She decided to sit down and sketch the scene. Soon it became too cold for her to be able to hold her pencil, so Barbara had her husband take a picture of the scene with his camera. 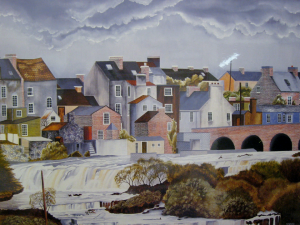 Later, when Barbara painted this picture, she painted the town first, then flipped the canvas over and painted it again. The artist did this to get the reflection just right, then she painted the frozen water on top. The water is a horizontal LINE. Horizontal lines make the viewer feel relaxed, like you want to lie down too. Barbara tries to paint her daughter and her dog in paintings as much as possible. 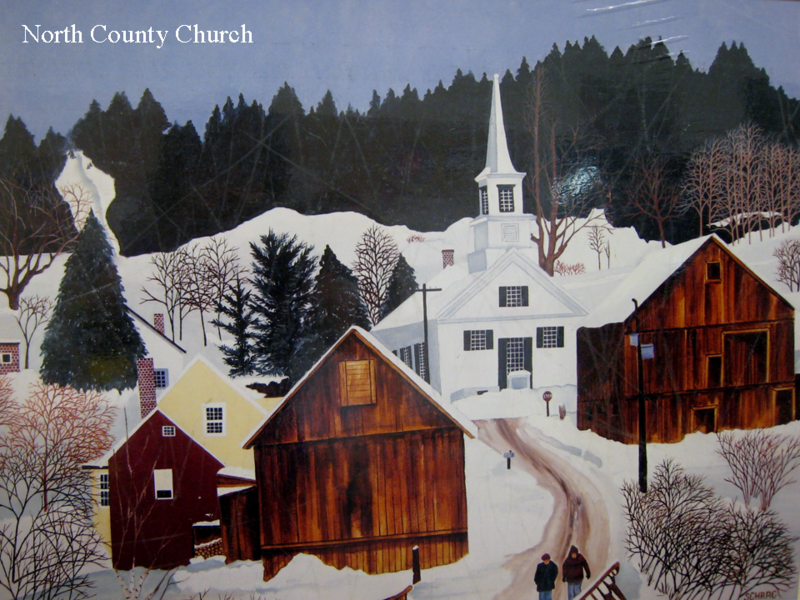 Barbara’s daughter also helped her paint all the snowflakes in this picture! The painting is very large and it is the same size as most of Barbara Shrag’s original paintings. Can you find Barbara Shrag’s daughter and her dog in this picture? What are the people in this scene doing? Why is it snowing only in the sky? Create a snow scene with many dots of snow. To create all of the dots the same size, use the end of a paintbrush that is dipped into the paint each time it is touched to the paper. If you don’t dip the tip EVERY time, the dots will become progressively smaller. Wipe the tip off with a paper towel every once in awhile, to keep the paint from building up and changing the look of the dots. Cotton swabs are also good for creating snow dots but they will be larger. Encourage the class to create MANY dots, the same way Barbara Shrag’s daughter did, in this big picture! Create a landscape that is reflected in water. 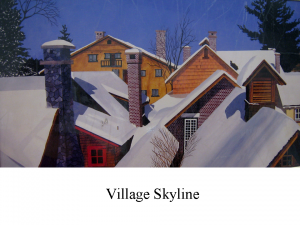 Begin by painting the buildings, hills, mountains and trees. Then turn the picture over, just like Barbara did, and copy it again. Cover over the reflected scene lightly with blue colored pencil or crayon, to create the look of water. Cut out enough Landscape scenes from magazines for each student to have one (Try Sunset or other magazines). Glue the magazine landscape on a paper background and copy the shape of the landscape upside down, underneath the magazine landscape (so that it reflects). Color in the drawn landscape and the lake or river that is causing the magazine landscape to be reflected. Barbara once saw this scene while she was in the state of Connecticut. She was across the street, waiting to be served breakfast, which was taking a long time. Barbara always has her sketchbook with her, so she filled in the time sketching this house, which she could see through the window. One day, Barbara’s daughter insisted she paint a Halloween picture. Barbara went through her pile of sketches and found this house. She painted the house and added the children to give it the “Halloween” look. Most artists collect sketches of things they have seen that would be interesting to paint. Things an artist might include in their sketchbooks might be drawings of different types of trees, bushes or flowers, different shaped buildings, different types of cars and trucks. Once they have a collection of many drawings it is often helpful when they can’t think of just the right type of tree to put in their park or the type of car to park in front of a house they have painted. Artists can just check through some of their sketchbooks for ideas. What type of MOOD does this painting have? Not exactly dangerous, but a little scary! What season is it? Does it look cold? How did the artist use SIZE in this picture to make the scene seem scarier? The trees and the house are very large in comparison to the children. Barbara made the children very small. The moon is almost larger than the children are. The small size of the children, compared with the size of everything else in the picture, along with the name of this painting, leads us to the impression that the children might be a little nervous and apprehensive. 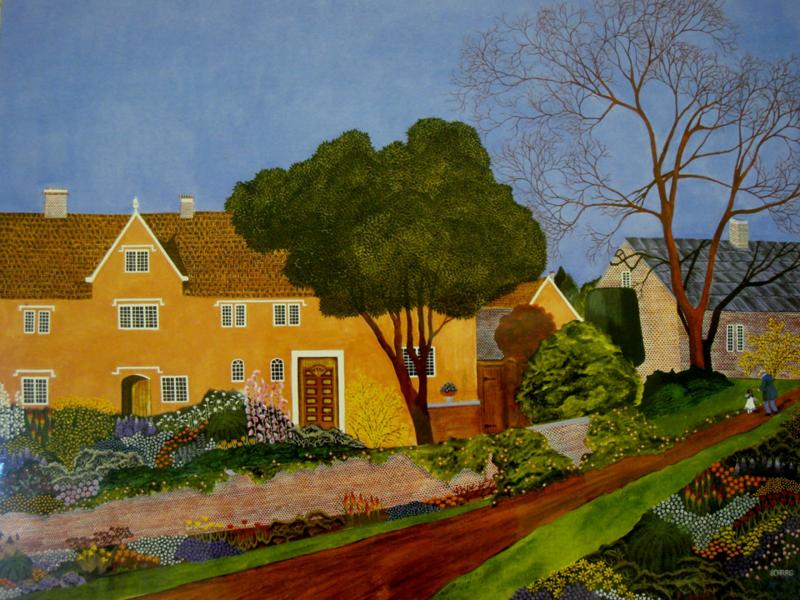 How does the artist make the house seem far away? The sidewalk is wider at the bottom than it is at the porch. This gives the illusion that the narrower area is farther away from us. The size of the children on the sidewalk also helps us feel that they are far away from the house. Barbara carries a sketchbook with her wherever she goes. Create sketchbooks from several sheets of paper with a decorative construction paper cover. If the weather is nice, go outside and sketch a piece of playground equipment or a tree. Encourage the class to fill their sketchbooks with additional sketches of things they see around their own house or neighborhood. Challenge the class to fill the sketchbook and show it to you on your next visit. Create a seasonal scene, with a large house as the focal point, from cut paper. 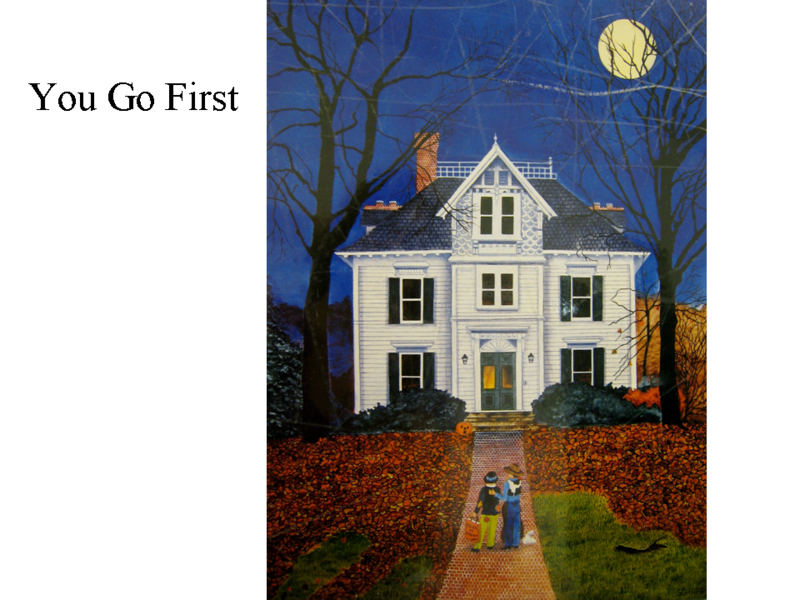 Place the house higher on the page and create a walkway that widens at the bottom of the page and narrows at the porch, just like this picture. Cut all of the details of the picture from cut paper also. This is a picture of Pike’s Street Market, in Seattle, Washington. Barbara used to regularly visit the market with her mother when they lived in Seattle. They used to take a fold up wire basket to the market and her mother would buy fresh food for their dinner. Barbara really wanted to do some sketching at Pike’s Street Market, but to beat the crowds she had to get there early—at 5:30 am! This is a Folk Art picture, mostly because it shows the way daily, ordinary life looks. Have any of you ever visited Pike’s Street Market, in downtown Seattle? Where do you see REPETITION in this picture? What kinds of food are here? Do you ever go to the market or grocery store with your mom or dad? Bring in some vegetables—a bunch of carrots, a cluster of green onions, some radishes, a head of leaf lettuce, and some potatoes. Lay these close together, across a table at the front of the room. Discuss the different colors, shapes and textures of the produce. Have the kids fill an entire page with a close up view of the vegetables. Cut an apple, an orange, a grapefruit and a head of cabbage in half. Have kids paint the sides of the fruit or vegetable with different colors of tempera paint. Print a design on a large piece of paper. Kids could create a face using the cabbage half to stamp the head shape, a quarter of an apple for ears, a small tangerine for eyes, a quarter or half of a grapefruit for a mouth. Store the cut up fruit and vegetables in a Tupperware type container, covered with water, to bring to the classroom. Dry these well with a towel before the kids start to stamp with them. It is easiest to use a large foam brush to apply the paint for stamping. Barbara and her husband were driving around and found themselves very low on gas. They took the first exit they could find to refuel. This painting shows the scene they happened upon. There were not any children sledding but Barbara liked the idea of adding the kids to her picture! Was it okay for the artist to add the children sledding to her picture, even if they were never really there? Of course! An artist creates whatever they feel looks good in their picture. Does this picture make you feel warm or cold? Do you think it is noisy or quiet in this picture? There are hardly any people and nothing is moving except the kids. You can’t see any cars, which usually make noise. There aren’t any animals to make noise, like barking dogs. With the snow all over the place, the few sounds there are should be muffled and quiet. Barbara stood on a cliff across the cove to get the right angle for this picture. What is a lighthouse used for? A lighthouse has a very bright light that can go through thick fog. Without lighthouses, many ships would have crashed into the land. Today, ships have radar and other equipment to protect them from doing that. Now we can remember this lighthouse, even when it is gone, because of Barbara Shrag’s painting. How does Barbara make the water look real? Using different tints and shades of blue, green, and gray, along with the white curving LINES of sea foam, which makes the water seem like it is moving. How long do you think it would take to get up to the lighthouse from the bottom of the picture? Why do you think the artist painted a tall, skinny (vertical) picture with this scene, instead of a wide (horizontal) picture? It creates an illusion that the lighthouse is higher up the edge of the bank and farther away from our view. It creates an unusual perspective. Can you find the HORIZON LINE in this picture with unusual PERSPECTIVE? The horizon line is easy to find (where the trees touch the sky) but asking the kids to look for it will help them notice the unusual angle of perspective in this picture. Looking for the horizon line will get the kids to study the painting a little bit closer, which will help develop better observation skills. (Stress relationship of 2-D shape and 3-D form with this project for grades 3-5.) Create lighthouses using paper towel or toilet tissue tubes. Add a cone roof by making a circle ½” larger than the tube and cutting a slit on one side to the center. Overlap the cut edges and tape, or glue, to form a cone. Attach to one end of the tube (cylinder). Paint the lighthouse. Add door(s) and window(s). Decorate with painted checks, stripes, seagulls, shells, sand, etc. Check out a book showing photographs of lighthouses and share this with the class. You might be able to find a calendar with photographs of lighthouses. Have the class draw and paint a picture of a lighthouse. Draw a self-portrait. After you are finished, look at it to see where you could make some changes. Redraw your self-portrait and you will be surprised how much more accurate it will be. This is what artists do. Sometimes artists draw many, many sketches before they get a picture the way they want it to look to create their painting. Drawing and redrawing helps an artist learn. It is kind of like a basketball player throwing baskets everyday so that he will be able to make more points on the day of the game. Barbara collects sketches of interesting scenes or buildings, which she saves for future paintings she may create. Call a friend on the telephone and agree to both draw a “cat”. When you get to school the next day, compare your pictures. They will be very different and that is how it’s supposed to be. Neither one is better–they are just different! Have kids draw a picture of something simple (a vase, cup, shoe, toy) and not let anyone else see it. Give the class 3 or 4 minutes to do this exercise. Then, have the class bring their pictures to the front of the classroom and compare the differences. Remember—artists want their artwork to be original and unique. Artists create each picture their own way. Find a character you like (from a comic strip, magazine, movie, or coloring book), spend ½ hour a day, and work on the picture, one part at a time, for several days. You will be surprised how much easier this strategy makes it to be able to draw the character you have chosen! If a picture look hard to draw, just draw one part at a time. Then, put the pieces together to form the entire picture. Spend about a ½ hour each day and work on the picture, one part at a time, for several days. You will be surprised how much easier this makes it!